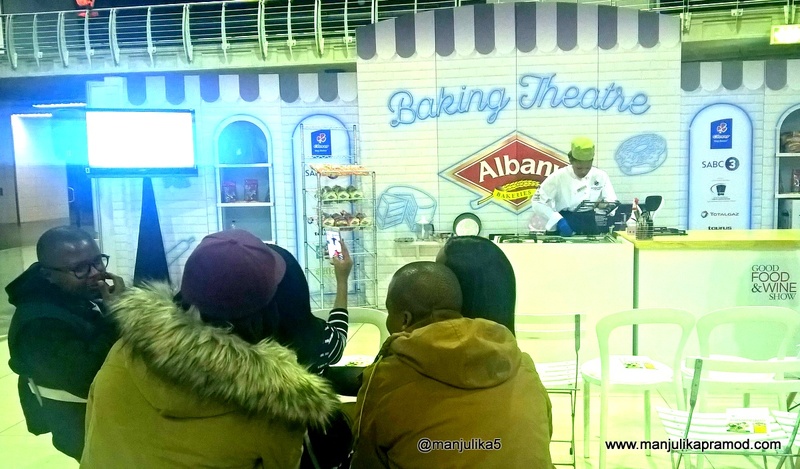 Johannesburg gave me a ‘Good Food & Wine Show’ experience! This one is for the foodies, seasoned cooks and MasterChef viewers. 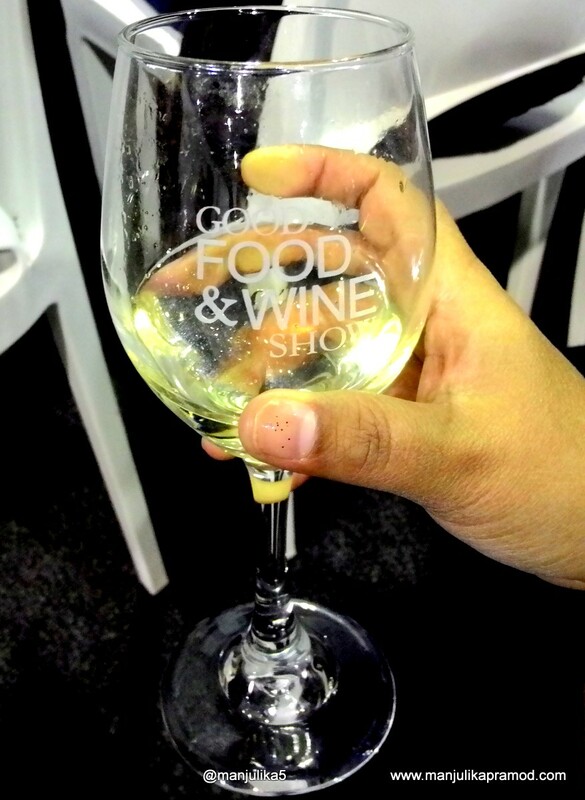 If you have ever wanted to attend the famous ‘Good Food & Wine Show’ in South Africa and have not been lucky yet, you must read and live a virtual experience through my first time. I aren’t a great cook but I always have my eyes and appetite for great food. Luckily I have been in South Africa for the past six weeks and have been trying to make the most of it by picking on different experiences covering art, history, food, culture, wildlife and more. The Saturday that has just gone by brought a unique chance to meet and mingle with the MasterChef fans in Johannesburg. I had been looking forward to the Good Food and Wine Show but winning double tickets was definitely an added adventure. 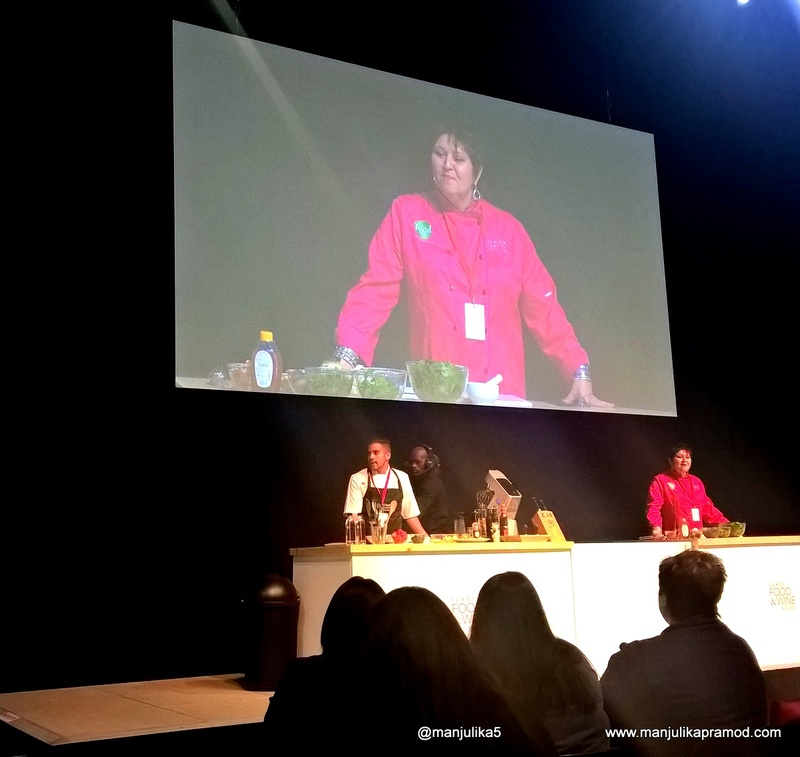 It was quite an opportunity for me as a foodie as well as a blogger to take back an interesting experience from the most celebrated culinary event of South Africa. We decided to go on the Saturday because I wanted hubby to accompany me. The distance from Santon to Ticketpro dome’ made up for 38 minutes via the highways. I could not make it to the venue when India’s Prime Minister, Mr. Narendra Modi had come earlier this month. He had met met and greeted people in this hall itself.Located in the north of Johannesburg, South Africa, ticket pro dome has a seating capacity of approximately 20,000 people. The dome as clicked from the parking center. Toast to prolong the taste! The parking was hassle free and we quickly made our way to the main entrance. The signboards spoke of the event and it was very easy to locate the accessibility. We could see a lot of buzz from a distance. I walked towards the media counter and informed them about my whereabouts. I just had to tell them that I had won the tickets through the contest organized by Jozi style, and it was very simple after that. The lady at the counter was quick to hand over two tickets to me. Hubby and I happily walked inside. Just there, it was quite a unique welcome. I was amused to see toasted breads hanging in the air. The message that came along with it was definitely worth a read. 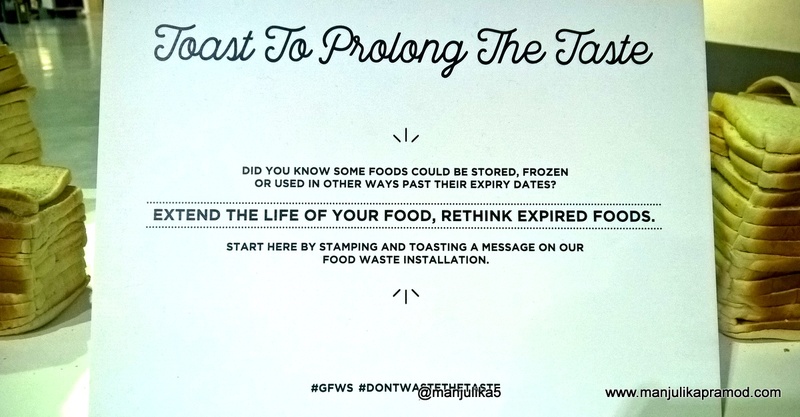 A lot of food is wasted and therefore it was very important to remind people that we can use the food in different ways even after the expiry date. As we walked further, we reached the display where a beautiful bottle spoke about ‘Flavors of Johannesburg’. 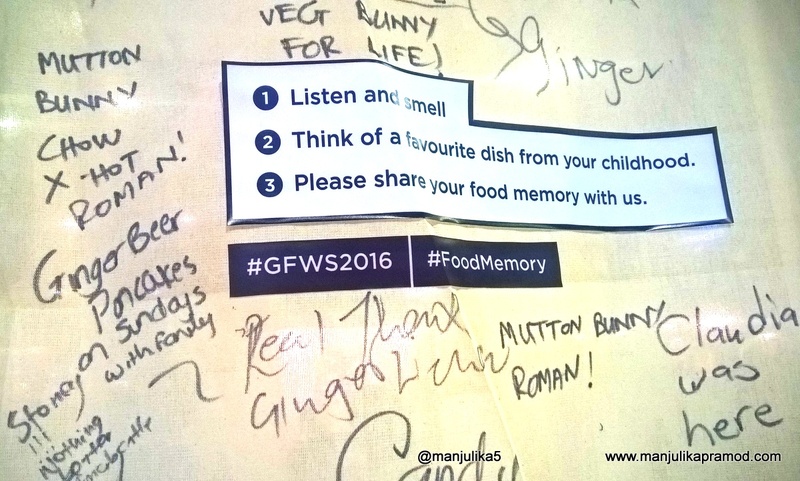 When I stopped to look further, it was fun to see food memories. I stopped to listen and smell and shared my food memory. There were so many things that came in my mind but I wrote about Biryani. Those memories from Lucknawi Biryani cannot be overruled by any food in the world. We had hardly moved a few steps when we discovered ‘Short Chef and Skinny Chef’ arena. Short Chef, Skinny Chef is a uniquely South African food entertainment theatre, hosted by the Chefs Siphokazi and Claire. They were about to start the session slated for that hour. Most of the seats were already being taken but we did locate a few vacate seats and grabbed them. It was a lovely and informative session to learn cooking as well as cooking tips. Some good wine (Porcupine Ridge Sauvignon Blanc wine) was served as well as we tasted their signature dishes Arancini balls and Creme Brule Rice pudding. I absolutely enjoyed the short and sweet foodie session. I am sure this was one of the many reasons why everyone was ga-ga about this food and wine expo. Of course, the headline chefs like George Calombaris, Matt Moran, Siba Mtongana, Jenny Morris, Neill Anthony, Sarah Graham, J’Something were the highlight of the show but apart from them, there was lots that impressed me in the next two hours. The theatres were great fun and it was difficult to choose one over the other. 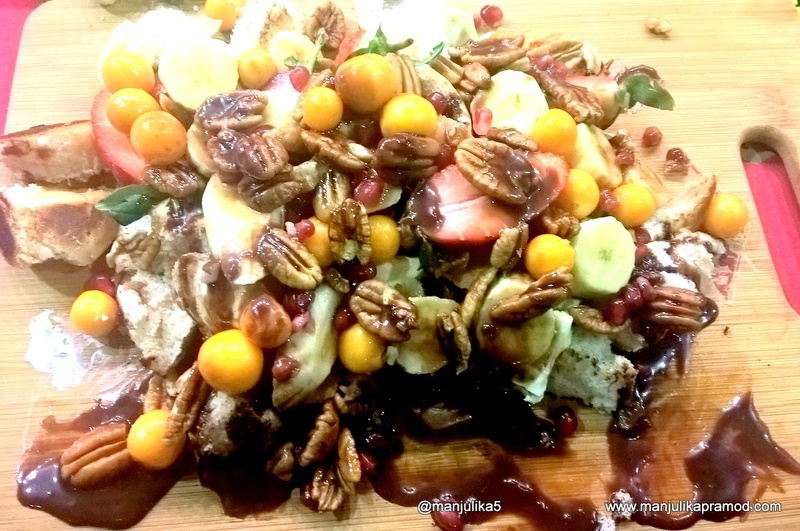 The Baking theatre had just winded up when I reached that section of the hall but we did not buzz until we had tasted the dish (picture below) prepared from Albany breads, fruits and chocolate sauce. It was simply amazing. I did not settle with just one bite but digged in three wholesome chuncks. Albany bread was used to make this and it tasted delicious! I mean I knew about Chemistry and Physics labs but din’t know that a Cake Deco lab existed and could be so very exciting. This part of the hall was buzzing with creativity. 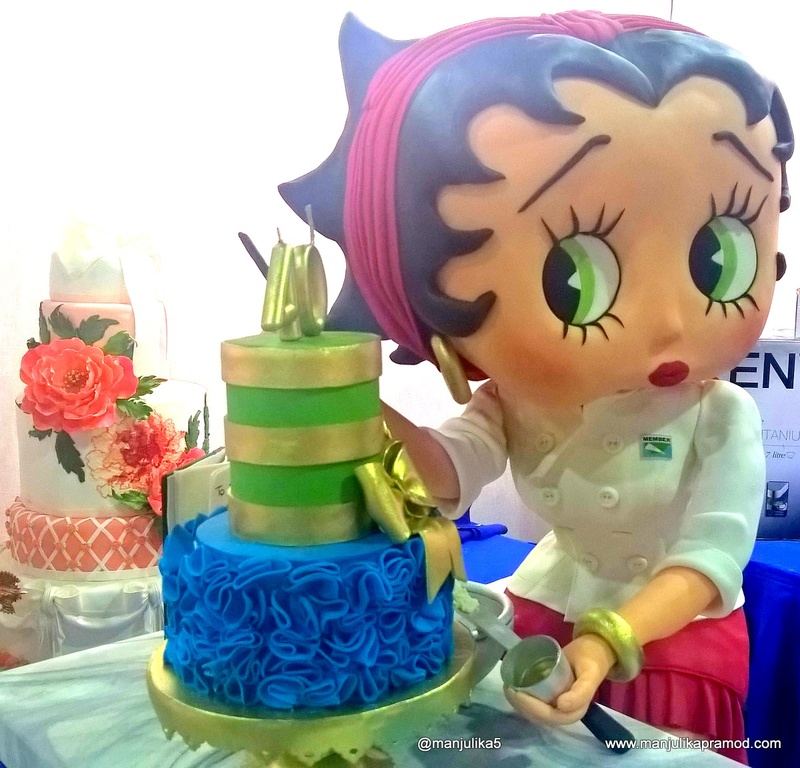 I was really-really impressed with sugar art creations, cakes and sugar crafted decorations that came my way. The display of cakes at the end of that lane was amazing. You must check out the slideshow to be impressed yourself. I couldn’t pick my favorite. They were so colorful, so beautiful and so artistic that I couldn’t take my eyes off them. Since it was already 6 p.m. and we had to be back home by 8, my husband kept reminding me that I must hurry up, else I was in no mood to leave those cakes behind. From here, we moved on to the ‘Cooking with Chefs Theatre’. Matt Moran, Australian food icon, TV star pioneer of ‘paddock to plate’ was taking a class and it was quite a full house. I did not stop for that and continued to walk to the Wine Theatre. The Wine pairing table was buzzing with people and I could see that South Africans loved drinks dearly. The best part of the show was that entry to all except two of the theatres was open to the public on the same entry ticket without any additional charge. In fact, I also got a chance to hear Jenny Morris, the giggling gourmet at Chef’s Open Theatre. 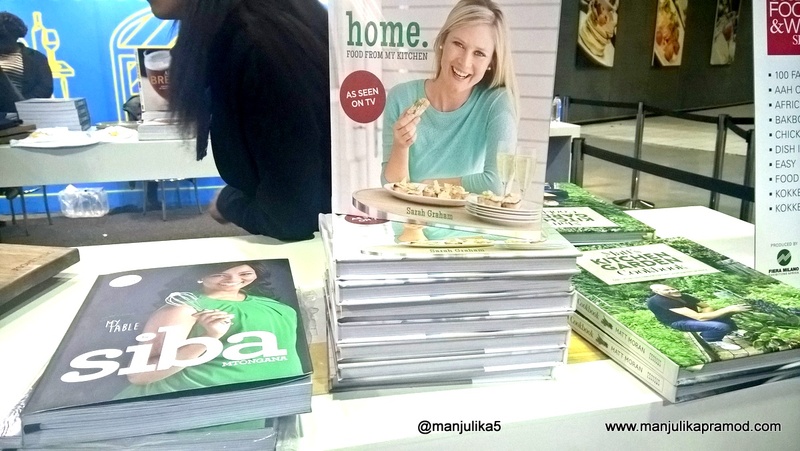 She is one of SA’s most-loved food personalities, an author, magazine writer, radio and TV presenter. No doubt we had a hilarious cooking session with her. The cooking tips were really very handy and of course she reminded on the theme ‘Fresh’ and why food should not be wasted. She also gave some suggestions on storing food. After this, we walked to the store which had books written by some of the celebrity chefs of South Africa. I did not pick any but yes it was good to see and find out that what did the South African foodies loved writing and reading. From there, we also arrived at the arena where they claimed you could become a wine expert in just five minutes. I was really curious because both husband and I are teetotaler so it was a great way to appreciate wine without tasting it. We actually smelled all the varieties and happily made out the distinct difference among each of them. This was the place for wine connoisseurs. In the last forty minutes, we checked on the food stalls, tasted from different counters and ate a little bit here and there. I was happy to spot an ‘Incredible India’ stall too. They were offering delicacies from Mumbai. Once again, I was amused to find amazing varieties of chilly pastes here as well. 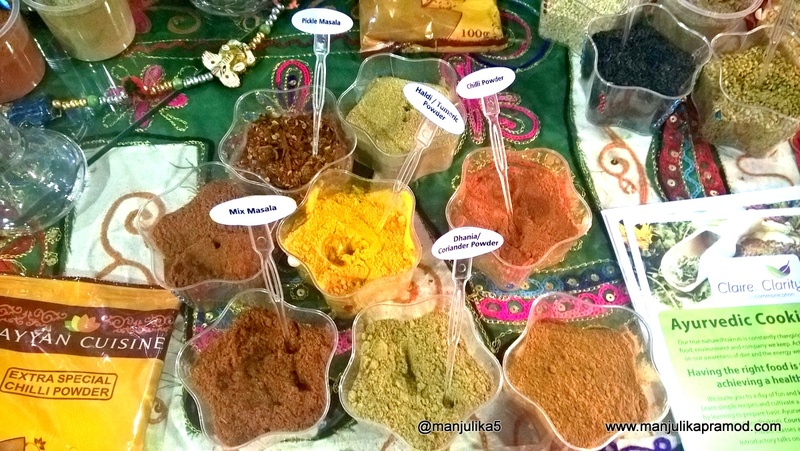 From my experience, I can easily say that South Africans love to make and sell varieties of chilly pastes and sauces. 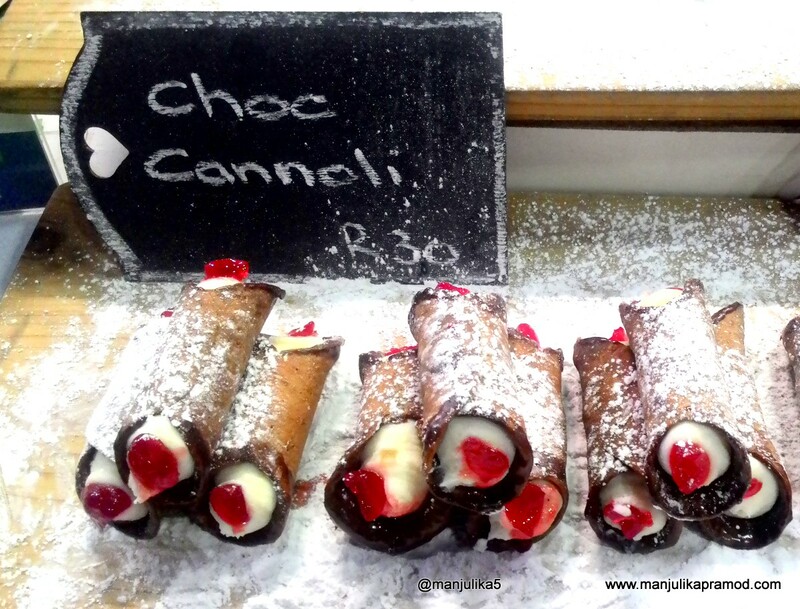 From Farmers market to Jozilane festival to Fordburg market, we have never been disappointed. Here also we quite enjoyed tasting them and buying a few too. Next, we walked around and checked out some more stuff. Finally, when we had covered it all, we decided to head home. There were lot of sessions still going on but we could stay longer. Here are a few more clicks from that tasteful evening. 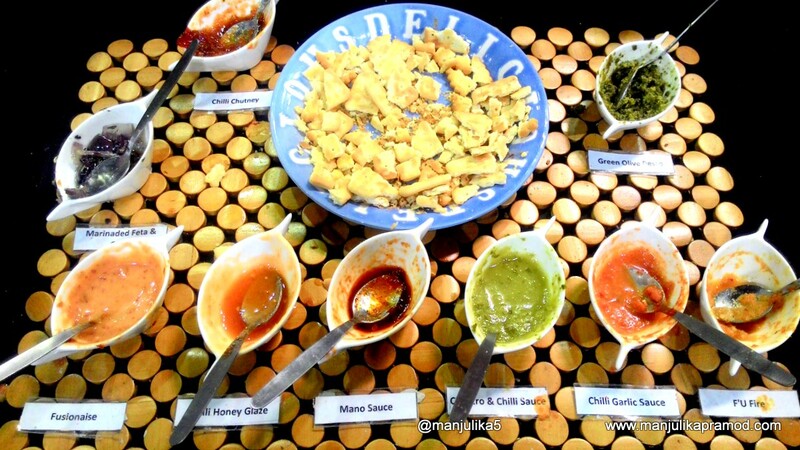 The varieties of chilly pastes and sauces are amazing! 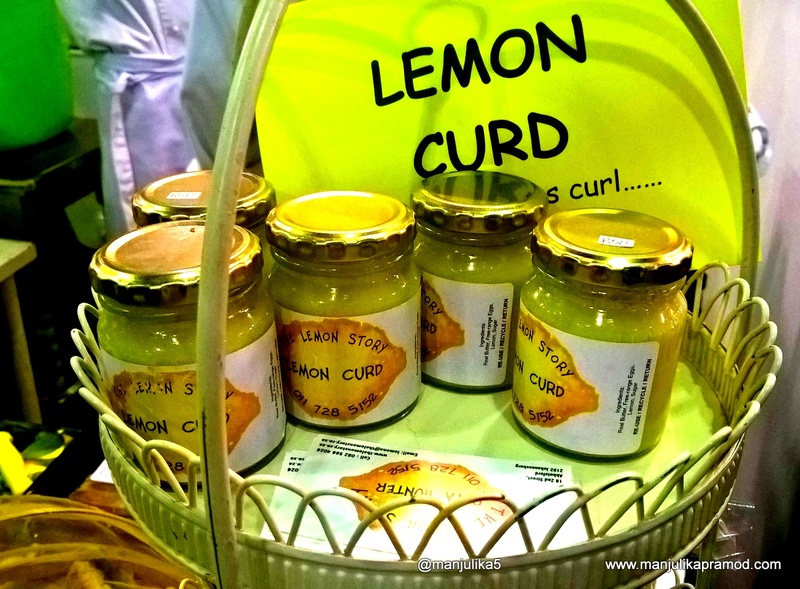 Lemon Curd-This really looked interesting! Good Food and Wine Show store! Catch up the next edition in Cape Town! Looks like fun! Always great learning about food from different countries and parts of the world!